Yet another SinglePlatform customer was recognized on TripAdvisor’s recent Top 10 Burgers in America. We know, our customers rule! Travel site and our partner, TripAdvisor, released the juicy list last month. To qualify, the restaurants had to have at least 200 reviews, at least 4.5 out of 5 stars, and 10 locations or fewer. The ranking was based on the millions of reviews and opinions the site has accumulated, so we’re pretty confident that spots on the list were well deserved. And Pearl’s Deluxe, a SinglePlatform customer, was one of the deserving burger joints to make the cut. 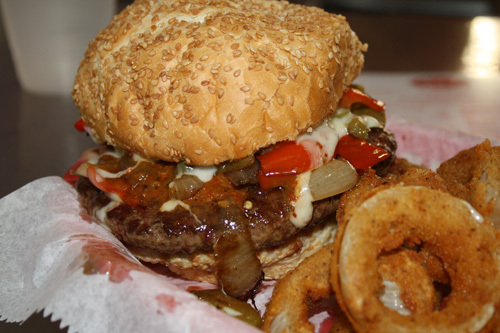 We talked about the other SinglePlatform winner, Brooks Burgers, last week on our blog. Today we’re focusing on the other honoree, Pearl’s Deluxe. Pearl’s Deluxe is a pleasant surprise where you least expect it. The small facade on a San Francisco strip has been home to some of America’s best burgers for fifteen years now. And although the outside isn’t all glitz and glam, what they’re serving up inside is something to talk about. The menu items are a mixture of simplicity and specialty. All burgers can be made with a chicken breast, turkey, or veggie patty instead of beef. If you’re feeling fancy, you can also upgrade to a buffalo or Kobe patty. The classic burgers come topped with lettuce, tomato, onion, and mayo. If you’re feeling more adventurous, go with one of Pearl’s 11 “special burgers,” all of which come in ¼ pound and ½ pound sizes. The Phat Bob boasts BBQ sauce, bacon, mayo, onion rings, and jack cheese. The Bula is topped with jack cheese, bacon, mayo, and spicy BBQ pineapple sauce. The Bomb? An open-faced burger with homemade chili, shredded cheddar, and diced red onions. Pearl’s uses natural beef from Niman Ranch, and offer other Americana staples like hot dogs, milkshakes, and an assortment of fries in addition to the burgers. 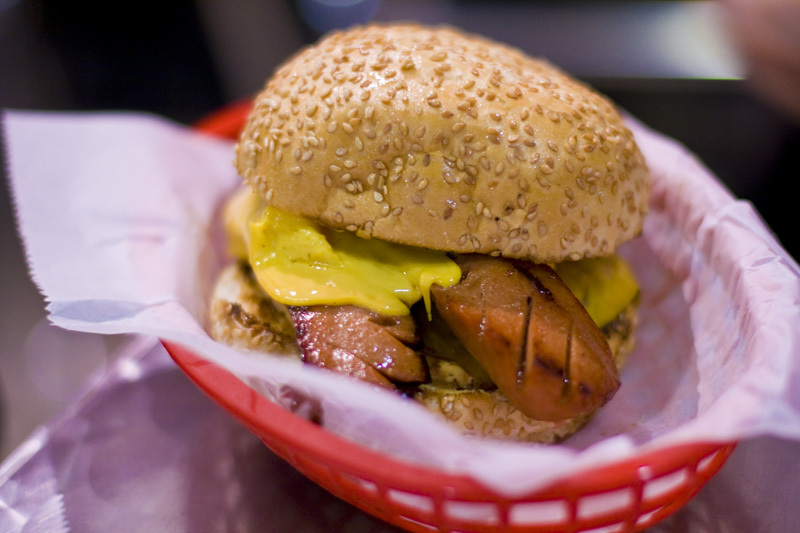 In fact, Pearl’s signature burger, rightly dubbed “The King” is topped with a ½ pound hot dog! The massive creation also features American cheese, cheddar cheese, and thousand island dressing. 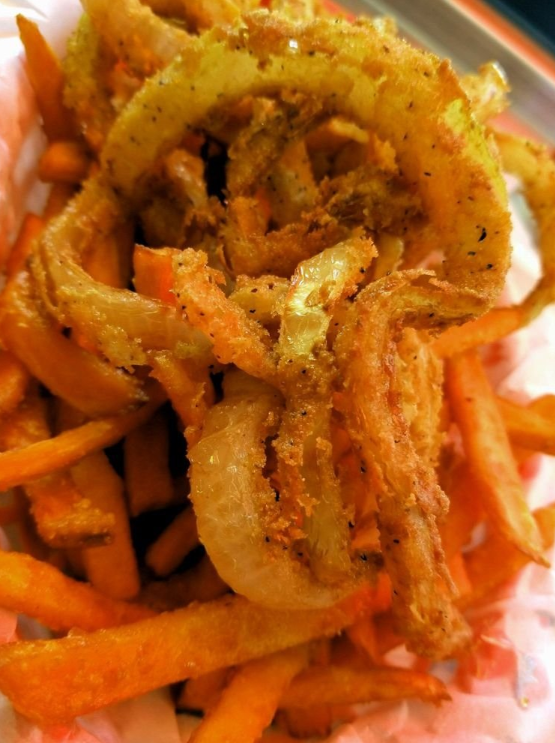 If you’re not in the mood for plain fries, Pearl’s Deluxe also serves sweet potato fries, garlic fries, and homemade onion rings that TripAdvisor user Peterisme called “out of this world.” Can’t choose between fries and onion rings? The restaurant is also known for its “Frings,” a mixture of the two served in a single dish. As for the owner, Sylvia Yi is a Korean American born and bred in San Francisco. She describes San Fran as a “food mecca” which influenced some spicy additions to the Pearl’s Deluxe menu. And Sylvia’s family is no stranger to the restaurant industry. Her mom ran American diners, while her aunt and uncle had a fish and chips place. At Pearl’s Deluxe, Sylvia’s love for spicy foods has inspired her to mix south of the border ingredients with flavors from her Korean heritage. And this isn’t the first accolade Pearl’s Deluxe has received. Did we mention that Tyler Florence chose Pearl’s Deluxe as his pick for The Best Thing I Ever Ate? Burgers are an American staple. But, the mastery of burger making goes far beyond the grill in our backyards. Pearl’s Deluxe has perfected the art of burger-making, from the quality of the ingredients to the abundance of the toppings. And after they were chosen as one of TripAdvisor’s Top 10 Burgers in America, it’s safe to say their burgers are pretty darn delicious. Pearl’s Deluxe has been a SinglePlatform customer since 2013.